Williams, Arizona is known as the "Gateway to Grand Canyon" and there is no more stylish way to visit the Canyon then with a stay at the hotel and take a ride on a Grand Canyon Railway to the South Rim. The Grand Canyon Railway made its first journey to the Grand Canyon on September 17, 1901. And since that time, notable passengers to ride the Grand Canyon Railway include Theodore Roosevelt, John Muir, William Howard Taft, Franklin Delano Roosevelt, Dwight D. Eisenhower, Clark Gable, Jimmy Durante, Doris Day, Warren Buffet, and Bill Gates. Coin #1 Commemorates Baldwin Steam Locomotive # 4960 - The Grand Canyon Railway was scheduled for demolition following the shut down and basic abandonment by the Santa Fe Railway in 1968 but was reopened for passenger service on September 17, 1989, by entrepreneurs Max and Thelma Biegert—88 years to the day of the first passenger train to the Grand Canyon. Dubbed the French Fry Express, Locomotive No. 4960 runs on recycled waste vegetable oil – minus the crispy bits collected from restaurants in Williams and the South Rim. The 1923 Baldwin Locomotive Works engine was converted in 2009 to run on WVO, an innovation that reduces emissions by half. This was the first engine to haul visitors from Williams to the Grand Canyon. 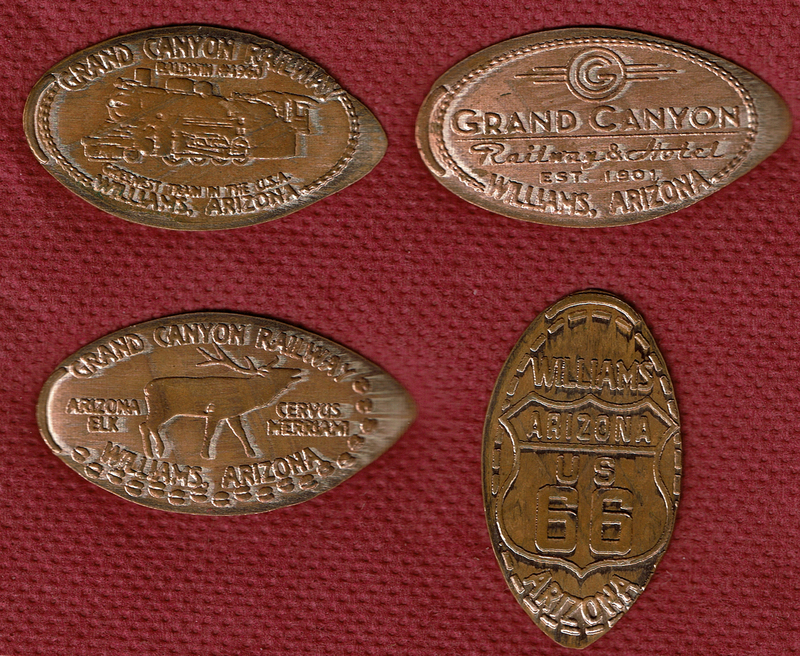 Coin #2 Celebrates the Grand Canyon Railway and Hotel. The Williams Train Station was originally a combination Station and Hotel known as the Frey Marcos operated by the famed Fred Harvey Company which contracted to provide visitor services, dining and lodging all along the Santa Fe. Coin #3 Commemorates The Merriam elk. This elk was first identified and then named by famed 1880s biologist Clinton Hart Merriam who traveled to Northern Arizona in 1889 when he developed Merriam s Law of Attitudinal Equivalent and the Merriam Life Zone Concept as well as named this elk. The Merriam Elk was hunted to extinction about 1905 and was replaced in the 1940s with Yellowstone elk. Coin #4 Celebrates Arizona Historic Route 66 - The Main Street of America. Williams was the last city in America to be bypassed during the construction of Interstate 40 and they celebrate Historic Route 66 each year with the Route 66 Car show. As Route 66 passed through Williams it divided into two streets with one going West and the other going East. Williams has preserved much of its historic character with many of the historic buildings dating from the heyday of classic automobile travel.